Theodore did not spin his Christology from nowhere. I honestly think we have a comprehension problem here on what Mar Theodore actually wrote. He is not Arian, Adoptionist, Apollinarian, Sabellian, Modalist,etc. his Christology is that of the apostles, it is not his fault Greeks make everything insanely "scientific" and cannot understand that the Revelation cannot be fit into a pre-established box every time they want. Really, compare Syriac to Greek. Read a book in Syriac...no vowels! What do you expect? That is why he had an alphabet developed by St. Mesrob. He wanted to be able to translate and bring in theological writings from other traditions besides the COE. My, my, aren't we suspicious. I'm a little disturbed by the baptized Muslim polemics. He didn't "invent" a new language: Armenian had been in existence for quite some time, and the Armenian nation for at least a thousand years by the time of St. Mesrob. It was the language his people spoke. Why shouldn't they read the scriptures and worship in that language? Aramaic had plenty of heresies running about. Mani made a point that he was born in an Aramaic speaking society, and wrote his Bible in Syriac. And he wasn't the only Aramaic heresiarch. Aramaic had been eclipsed as linqua franca by Greek since the time of Alexander. 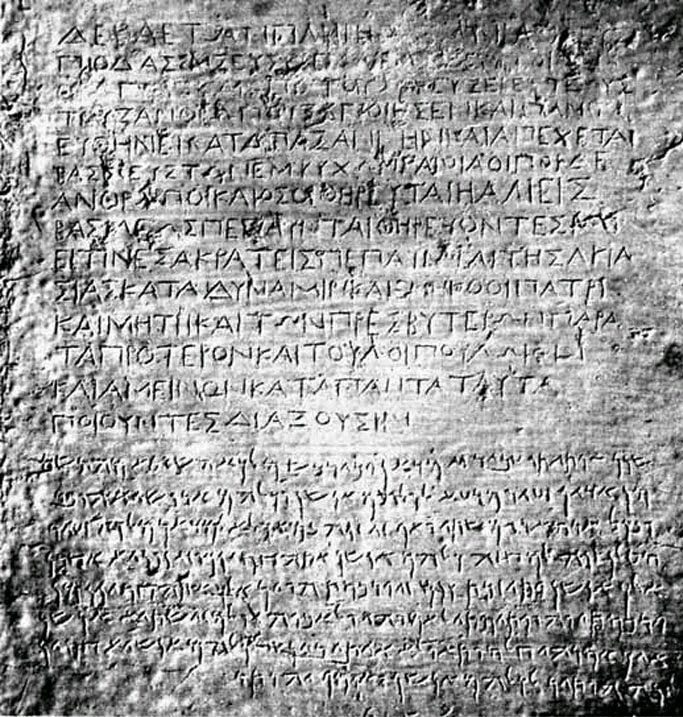 Asoka in India did set up Aramaic inscriptions, but under the Greek. There were several Greek kingdoms in India and the area between Iran, Central Asia and India. The Romans, who used Greek, had taken Mesopotamia just after the NT was finished, and the rest of the Syriac heartland almost a century before the council of Nicea I. The Aramaic, and Syriac, languages themselves show the influence of Greek. Maybe because they perceived the COE as more orthodox. Strange, I don't recall that word being a self-identifier for you Assyrians. No, it's used. But that doesn't mean much, because the Arians, for instance, call themselves "Catholic." As soon as you create a language you innovate. You decide the grammatical structure and syntax, the system of vowels,the very way people think. The Greeks were 100% absorbed and orientalized, Aramaic predominated. Loan words in Aramaic mean nothing, Hebrew has EGYPTIAN loan words. Why shouldn't they read the scriptures and worship in that language? As for the Muslim thing, Islam is derived from Syriac Christianity. Mohammed is a Syriac heretic correct. The DL of His brother James at Jerusalem is older. Every Liturgical scholar I am familiar with concede the oldest extant Liturgy to Mar Addai and Mari, dating it to 3rd century, that of St. James to the 4th. The present form of the DL of Mar Addai and Mari dates to the 6th cent. The catachesis of St. Cyril of Jerusalem (mid 4th) parrallels the text of St. James, which is attested in Coptic, Syriac, Georgian as well as Greek, and elaborate in each. The present form, yes, but that would be true of most present forms. The Anaphora of Addai and Mari is seen as contemporary with the Liturgy in the Didache which most date to the 3rd century. As soon as you create a language you innovate. You decide the grammatical structure and syntax, the system of vowels,the very way people think. The Greeks were 100% absorbed and orientalized, Aramaic predominated. Well, they must have been the dominant traid in the "absorbtion," because, as we see above, their language and cultural influence was paramount. Loan words in Aramaic mean nothing, Hebrew has EGYPTIAN loan words. I should think so, living 400 years there, and being led by an Egyptian prince who wrote their law. Better to Targum in Jesus's language no? No. That's what Pentecost was about. Then why are you imitating him and his followers? What better way to show how much you "loved" the Greek language to mint a coin saying "we love Greek"? Please Isa, you know better. You knw that Parthia played these little games with the Sleucids all the time. Where are your Indian Greeks then? They were completely absorbed, orientalized. They adopted the same gods as the Indians and soon reverted to speaking the native languages. As if living under Greeks for the same time wouldn't result in loan words no? So now we lose the original and let the doctrines of men override us? Was that not the reason the pharisees got trashed by Jesus? Do you wish the same fate of Jerusalem in the first century? I would never on pains of death or torture recite a blasphemy such as "Allah had no Son" or that Jesus was the (failed) prophet before Mohammed. NEVER. OH nearly forgot...the COE has the most ancient manuscripts of the Didache with it. So the COE has the "catechism" written by associates of the apostles with it. That's nice: what games did they play with the Assyrians? They survived until the time of Christ. We have their coins, inscriptions, etc. And no, they didn't adopt Indian gods, but some eventually became Buddhist. But then, so did some in the Aramaic world and the Roman empire. So now we lose the original and let the doctrines of men override us? Except for Matthew, we have the original NT. That we have only a few of the original words is just how it goes. I've explained my views on the implications for universality of the Bible here already. Was that not the reason the pharisees got trashed by Jesus? No. The Pharisees spoke and wrote in Aramaic (but not Syriac) like everyone else. Do you wish the same fate of Jerusalem in the first century? I was born about two thousand years too late to wish any fate on first century Jerusalem. Then why do you buy into their ideas of scripture? In Greek? Latin? Coptic? Ge'ez? So the COE has the "catechism" written by associates of the apostles with it. that page (19) deals with the issue of Greek and Syriac culture at Edessa. Attention all Roman Catholics: by the decree of Mar Papa Nicholas IV in 1288, the Catholicos Patriarch of the East has jurisdiction over ALL Christians of the East, from Baghdad all the way to China. Failure to obey this most holy Papal Bull is reason enough for excommunication. Yawn. That's no different from our belief that current Ecumenical Patriarch has jurisdiction over Constantinople. This doesn't mean we agree with everything he believes. Your arguements keep coming up flat. then show it. I've never heard of a Didache in Syriac. And what's King Abgar have to do with the Didache? Eusebius in his history says he translated the letters and other documents from the Edessene Archive. I guess I just can't understand the COE's aversion to God truely participating in our humanity. If he did not how could we be saved? If he did not, how could theosis be possible? The Didache was used to train people in the Christian faith in Antioch. Actually I don't know if we have an original Aramaic Didache. I will have to check. The Pope of Rome has spoken EX CATHEDRA there is no way out for you on this one. You either call your patriarch a liar or you accept his bull spoken not as a private theologian. We would not be saved if God's essence corrupted itself, a human nature not a frankenstein thing had to be offered as a mass or else we are DOOMED. Um, not sure what you are arguing here. Sure this guy had jurisdiction over the far east. That doesn't mean the pope agreed with what the guy taught. We never said that God's nature or essence was corrupted. In 1288 his cardinals did except for the "holy spirit does not come from the Son also" clause the COE doesn't believe in. The best friend of patriarch Mar Yahballaha (the first and only Chinese Patriarch of the COE), the holy rabban Bar Saumo also celebrated mass in Notredame at the Pope's invitation. So much for "unorthodox". I still think your ideas on Christology are unorthodox. Sorry buddy, no cookie for you. Yes, the pope in the Vatican at the time was quite unorthodox. The pope doesn't. See 1994 Christological agreement between Mar Dinkha IV and John Paul VI. Rafa, would you mind if I asked you a few questions about the Theology, Triadology, and Christology of the ACE? Sure. However I am not a fluent Syriac speaker and am trying to get someone more qualified on this thread though. Also because of the controversies the meanings of certain words changed during the debate with the COE. For example, Hypostasis was not used to convey "person" in it's history like it is now being used. Hmmmmm. I was going to focus on some Aramean terminology. I thought the ACE mostly worked in Syriac and tended to avoid speculating in the Greek. But given that you seem to have stated otherwise, what is the historical understanding of the meaning of hypostasis in the ACE? Also, what is your preferred title to refer to your church? "Qnome" was very similar in meaning to Hypostasis. The COE was referred to as "Nazarenes" within the Persian Empire and by the Muslims and their Caliphs. Later it became simply "Church of the East" and the present Patriarch added the "Assyrian" part to it to reflect that most of the members are currently ethnic Assyrians (ie: of Iraq). The "Chaldeans" are Assyrians who transferred their allegiance to the Patriarch of Rome instead of the Patriarch of Babylon and also have a few things not allowed in the ACOE like Icons, and a slightly different canon from the ACOE (the last 5 NT books are not in the COE reading cycle but are pious books reccomended for reading and often cited to respect sister churches). The Syriac Orthodox Church followed Cyril's teachings (made popular by Jacob Baradeus) and split from the COE. It's why the SOC is "rum orthodox" (ie: follow the rum, the Romans). Uh, no. The Arab and Middle Eastern resident Greeks are Rum orthodox. The Syriac are "suryaan." And they weren't "part" of the Assyrian church to break off from it. The "Chaldeans" are Assyrians who transferred their allegiance to the Patriarch of Rome instead of the Patriarch of Babylon and also have a few things not allowed in the ACOE like Icons, and a slightly different canon from the ACOE (the last 5 NT books are not in the COE reading cycle but are pious books reccomended for reading and often cited to respect sister churches). When did your church stop using icons? "Qnome" was very similar in meaning to Hypostasis. Could you explain in other words what qnome and hypostasis mean in your tradition? If you can distinguish at all between the two in meaning, that would be helpful, but otherwise just one meaning will be good as well. The COE was referred to as "Nazarenes" within the Persian Empire and by the Muslims and their Caliphs. Later it became simply "Church of the East" and the present Patriarch added the "Assyrian" part to it to reflect that most of the members are currently ethnic Assyrians (ie: of Iraq). Are you aware of the so-called "Orthodox Church of the East"? It's why the SOC is "rum orthodox" (ie: follow the rum, the Romans). Are you sure about that? I've only ever heard the Chalcedonians referred to as "rum orthodox". Uh, no. The Arab and Middle Eastern resident Greeks are Rum orthodox. The Syriac are "suryaan." And they weren't "part" of the Assyrian church to break off from it. Unless, perhaps, he has a similar ecclesiastically supremacist view as the EO and OO whereby the ACE is the last remaining representation of the original Apostolic faith. What makes you think that they started at some point? How perceptive that you noticed the way that I framed the question. The Church ogf the East stopped using icons under pressure of conforming to surrounding Islamic society. I have forgotten what centuries this was taking place.... anybody have a reference about this? All that remained in the churches were quite simple crosses. These days Assyrian faithful have icons in their home, the local Assyrian priest has an entire wall of them, but in the church itself he has only some quite plain wooden crosses. The agnus Dei was introduced from Syria, they were all Assyrian. There is no point in searching exceedingly old manuscripts of the COE since it burns its manuscripts whenever they fall in disuse. This is why some of the best manuscripts were brought from the Middle East by Western missionaries, because only newer manuscripts are used. The Genocide of 1915 did not help matters either. We hold the oldest Christian liturgy in use in the ENTIRE world, the Anaphora of Mar Mari and Mar Addai who were disciples of Jesus. On Papias: he said material was being TRANSLATED. It was his belief that Matthew was in Hebrew, this does not exclude the possibility of more material being in this tongue and being subject to translation. But you never asserted the possibility that the Gospels of Mark, Luke, and John may have been translated from another language to Greek. You asserted that Papias said that they definitely were. Now you're backtracking from your original assertion. Am I to read this as an admission that you can't prove your initial thesis? I certainly think this Bull, but I wouldn't call it Papal. Again, I ask, where do you get the idea that the ACE actually did use icons at some point? I never thought using the native language to translate the gospels and other writings for people was a heresy to the Assyrian Church. Rafa999, what's your native language? Please read this page: http://www.tertullian.org/fathers/timothy_i_apology_01_text.htm and please tell me what you think of it. It is a very theologically intense debate between Mahdi, the 3rd Abbasid Caliph and Mar Timothy I, the then Catholicos Patriarch of the COE which took place in 781 CE. If you still have doubts regarding what the COE really believes, and whether their Christology is compatible with EO and OO Christology then this 41 page debate should clear things up for once and for all - everything concerning what the COE really believe about Messiah and the Godhead is covered in there. Aside from a few typos, the fact that qnoma/qnome was mistranslated as person/persons (as usual! ), and the uneccessary translation of yodh as iota, this is the real faith of the COE. So please read it and we'll talk. Do EOs view COEs as Christian? That, alongside Rafa's insistence that God could not become man, makes the COE seem very similar to Islamic beliefs. It emphasizes God's transcendence over and above his condescension to humanity. EO'y allows both aspects to sit side-by-side in harmony. The Akathist of the Annunciation says: "for thus did God condescend, and not merely descend". In EO theology did God become incarnate through his Essence? Energies? Both? Rafa, Does the COE believe in the Real Presence of Christ in the Eucharist? Read the debate mentioned above between a COE Patriarch and a Muslim Caliph and see for yourself if the COE's beliefs about God are really that similar to the that of the Muslims. It is a very theologically intense debate between Mahdi, the 3rd Abbasid Caliph and Mar Timothy I, the then Catholicos Patriarch of the COE which took place in 781 CE. First, 781 is certainly after the delusional Muhammad's heresies came to have an overwhelming amount of influence in the region. I'd hardly call it a "pure" source that shows primitive Nazarene Christianity. Secondly, why are you using the BCE/CE system? It was created by apostates and non-Christians as a way to remove the confession of the lordship of Jesus Christ from public dialog. It is just surprising to me as a confessing "Christian" (I use the quotes only because I know many of you Messianics are not comfortable with all the theological baggage that is attached to it), you would opt for this system. I still think you are looking in the wrong place. Most of us are not nearly as concerned about what Mar Timothy in the 8th century or Mar Babai in the 7th century believed as in what Patriarch Dinkha IV and the flock under him believe *now*. To the extent that the current COE points to various historical documents as 'authoritative', then they are useful for understanding this--but only if we understand how the current COE interprets those documents. To put it another way, the Baptists point to the historical texts of the New Testament and say 'we believe that. Absolutely. 100%'--but when we explore how they interpret those texts we find that how they interpret those texts is not consonant with the Orthodox (and historical) interpretation of those same texts. So Mar Timothy may or may not have been absolutely 'orthodox' in his beliefs (obviously, I haven't had time to look at the text), but we still have an actual member of the COE making statements that are simply unacceptable from an Orthodox POV. Perhaps Rafa999 misunderstands the actual teachings of his church. Perhaps he is accurately representing the teaching of his church which has lost the understanding held by Mar Timothy. Perhaps you are the one misinterpreting Mar Timothy reading him through the distorting lens of a questionable translation and your own preconceptions. But only reference to what the COE says and teaches now will explain why there is a discrepancy.